If there is one thing that we get pumped about, it is introducing awesome new products to our loyal customer base. Without you guys, we wouldn’t exist. So many great things like beard competitions wouldn’t happen. Whenever a new product comes out, it’s so important that it is PERFECT. Sometimes it involves talking to the people around us for feedback on what they like the most about our beard oils and learning about more ways to improve your skin and glorious mane. If there is one thing that we have learned from our research, it is that asking some beautiful woman to talk to you about lavender oil is a major perk of working at Beardilizer! We love our original beard oils! Introducing a few new scents to our already killer selection was so hard. Beardilizer beard oils do so much already. After hours of research, a thousand e-mails, and a lot of asking our girlfriends to smell our beards, we were finally ready to tell you all. Starting immediately you can purchase the following new oils. Each one of these new oils has the same essential oils that are great for stimulating hair growth but also helps you prevent those awful ingrown hairs that destroy your skin (and the will to leave your house). Using a Beardilizer beard oil with your skincare routine, in a way that works best for your skin while making your lush situation look even better, does nothing but benefit you and your beard. The scents that we picked were chosen for a reason. Lavender oil is used in everything you’d see at a spa. It’s so good for you and it was the number one pick of almost every woman that we talked to. Work is really hard, sometimes. Talking to women about smelling like relaxation and learning about how to make your skin look good? It’s rough working at Beardilizer. It’s really rough. Unscented Freedom gives you the ability to mix and match more product, if you’re going for a textured look. When you layer product in, it can be overwhelming to some people. Keeping your beard as a neutral palate in order for you to have a foundation to build on is part of the Beardilizer way. Having the ability to do what you want with your beard, how you want it! The other great new scents all smell absolutely amazing. Having your beard smell like coffee all day, without actually dumping your coffee on your beard? Amazing. Chocolate beard, without the mess of a s’mores beard? Valentine’s Day is coming up, ladies of beardy dudes. We know you read this! 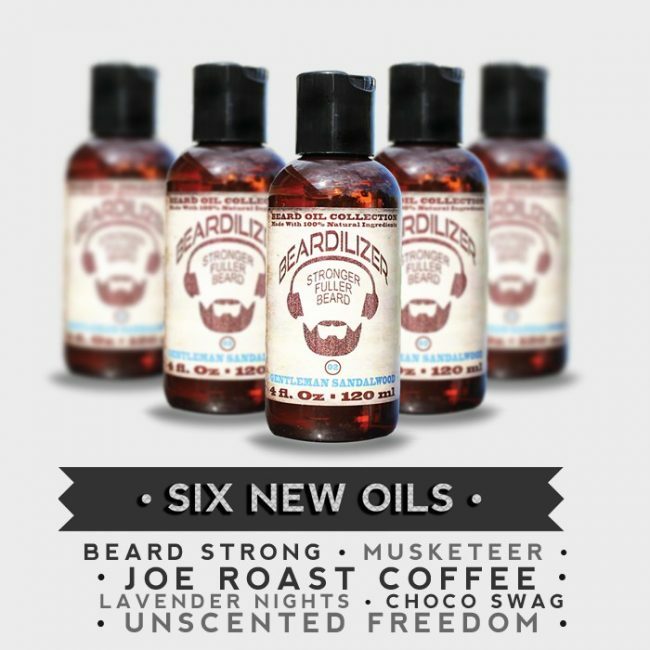 Musketeer and Beard Strong also offer amazing, Beardilizer-exclusive scents that Beardilizer girlfriends also demanded stay in rotation. Nothing but the best for you guys.